Volume 3 of the saga that never ends. 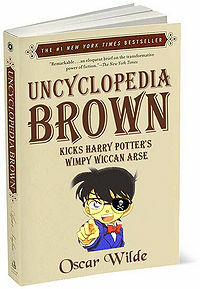 Uncyclopedia Brown is the fictional hero of a series of detective stories for small children written by Oscar Wilde. His real name is Rasputin H. Brown, but he is known by the nickname Uncyclopedia, due to his vast knowledge of facts, figures and dates, all of which are untrue, misleading and inaccurate. Uncyclopedia's father is the chief of police in the fictional town of New York, and often calls his son in to help him solve multiple homicides, negotiate truces in gang wars and resuscitate gunshot victims. When he is not helping his father, he works in his own detective agency. There, neighbourhood kids bring him cases, for which he only charges a quarter bag a day, plus expenses. He is assisted by his girlfriend Shara, who is a highly skilled ninja and political activist. A frequent enemy is neighbourhood lesbian bully Adalita "Bugs" Meany, who leads the "Latin Kings" gang — until book seven, in which Uncyclopedia frames her for possessing bomb-making parts, and has her sent to Guantanamo Bay. In book 8 it is revealed that Uncyclopedia hated Bugs and her crew because he was a racist. Uncyclopedia Brown was sitting in his office, trying to control the shakes, when in walked Nickname McPhee. Like all the kids in New York, Nickname had a single interesting personality trait, after which he was named. However, since no one could remember what that trait was, he was always known simply as "Nickname". Uncyclopedia was named after an uncyclopedia. An uncyclopedia is a big book of jokes, myths, facts and figures furthering a Europo-American viewpoint of history, in a misleading and inaccurate manner. 'What was the perp after?' asked Uncyclopedia, pouring himself a shot of moonshine. 'Did the insurance cover it?' asked Uncyclopedia. How on earth does Uncyclopedia Brown know this? To find out the solution, turn to page 48. The vital clue that Uncyclopedia needed was the fact that the perpetrator supposedly dropped the diamonds while escaping. Diamonds, being famously brittle arrangements of cardboard atoms, could never survive such a fall. Since Nickname didn't call for the insurance money, it obviously wasn't a profit-motivated crime; however, he left the crucial clue. Since he spoke using the Antarctic spelling of 'theater,' had a pet chupacabra (native to Antarctica) and was a fan of C.M. Coolidge (painter of pictures of dogs playing tennis), young McPhee clearly was himself a young dog, also known as a 'kitten.' Kittens are notoriously deadly animals, and Sad Kitten Huffing McPhee was participating in a dangerous activity with them, so Uncyclopedia was able to put two and two together and get twenty-two. 'Clearly Oprah did it,' said Uncyclopedia. Presented with this evidence, she broke down and confessed. Another case solved. Uncyclopedia Brown Jumps the Shark. (2006) (After this book, the series believed to have lost its wit). It has been said that Uncyclopedia Brown is a direct visual rip-off of Conan Edogawa. Gosho Aoyama noticed this and filed a lawsuit against Oscar Wilde. Gosho Aoyama lost the lawsuit and was somehow prosecuted by the defense ,AAA, and was then executed by Miles Edgeworth.